The international death toll in Afghanistan is on the rise – and not only for US-led NATO forces. Georgia has lost its first soldier to the war, but the country isn't even part of the Alliance. Somber faces and a closed coffin instead of happiness and a hero’s welcome. That’s how First Lieutenant Mukhran Shukavani returned home from Afghanistan. Mukhran Shukavani was part of an almost 1,000-strong Georgian peacekeeping force currently serving in Afghanistan. Another soldier from his unit was critically wounded in the same incident, losing both of his legs. “We’re doing everything we can to provide the Georgian army with proper assistance. The operation in Afghanistan is very difficult, but they are valiantly fulfilling their military duty,” said Deputy Defense Minister Nodar Kharshiladze. This is not the first time the country has sent men who've died fighting for someone else’s ideals. Georgia sustained losses back in 2008, in Iraq, before this tragedy in Afghanistan. Comparatively speaking, the casualty numbers do not measure up to those of other nations. But in this case the question is the motive. Many wonder whether these lives are simply too high a cost to pay for the president’s personal ambitions. Officials say more troops could be deployed soon, and some Georgians are now questioning whether their leaders have simply sold out. 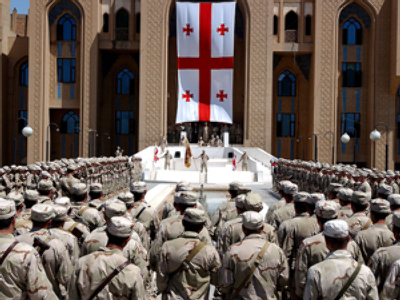 The opposition Labor Party firmly believes the presence of Georgian troops abroad is totally unnecessary. President Mikhail Saakashvili has never hidden his desire to see Georgia become a NATO member. But for the soldiers’ families whose lives are torn apart, his dream is their nightmare. Opposition leader Kakha Kukava says the Georgian president sent troops to Afghanistan to prove his loyalty to the US. But it’s still not likely to win him a ticket to NATO. “Everyone knows that president Saakashvili was a favourite during the Bush administration and now everyone can see that Obama refuses to meet him,” Kukava told RT. According to Fred Weir, journalist from the Christian Science Monitor, what Georgia is trying to do is show solidarity with the Western alliance, specifically with President Obama. Georgian President Saakashvili expects political rewards on his investments, but there is no such thing as reward for failure, Weir believes. “The thing is that he is buying a piece of an increasingly unpopular war. Even in the heartlands of NATO, polls show that populations even in the United States are losing faith in this war, they don’t know what it’s for and increasingly see it as propelling a corrupt and dysfunctional regime there,” Weir said. “You don’t really reap political dividends from failure. So probably it’s a bad idea,” he added. In Weir’s opinion, Georgia has kept no memories of its participation in the Soviet campaign in Afghanistan, and failed to learn from prior mistakes, but the growing casualty rate of the war will soon refresh the politicians’ memories. “Sad to say, it’s one thing to send troops off to battle with banners flying and trumpets blowing, and it’s quite another thing to welcome the coffins back, and that’s what they are experiencing today,” Weir concluded.